My last housesit for 2016 finished pretty much right on New Year’s Eve, so I was pretty lucky to get a last minute-ish housesit to return to the rolling hills of Coorparoo in the close-in southern suburbs of Brisbane. I had quite the menagerie to look after with a little ball of energy of a… dog-gone – forgotten the make and model! I think she’s a Maltese-Shi-Tzu, but maybe with a sprinkle of Cavalier in there as well. Jalapeno Crepes, my memory’s starting to get Swiss Cheesy in my advanced years! There were also two cats: a friendly young moggie, and a slightly more distant ragdoll cat. I rarely saw them during the day, but they were mercifully very good at coming inside in the late afternoon. Funny beasts: they’d willingly come in then would agitate after a while to go out again, but no, they were in for the night. And then there were two very low maintenance guinea pigs who looked after themselves and passed the days and evenings by eating, eating, eating, making noises like R2D2, and eating. 2 January marked the start of my very much overdue and very much needed dietary blitz, so the pigs and I shared very similar diets! The house, like many in Coorparoo, is pretty much directly under the flight path to Brisbane airport, but the planes flew over at just high enough to rarely be a problem. I expected a bit of commotion when New Year’s Eve struck, but apart from a few muffled thuds from the direction of the fireworks on Brisbane River, that was about it. A markéd difference to this time in 2015 when I was in the middle of the militiarised industrial pyrotechnics zone in Yagonna, New South Wales. The house was a leisurely (albeit hilly) stroll down to Greenslopes, then a bit of an extra hike to Stones Corner, so having no access to a car was no problem. It was a bit of a doddle of a week, with a couple of tropical storms to light up the sky and top up the pool, which was a blessed relief to have access to given the stifling heat throughout the week. The twice-daily dips were wonderful. We had Bill the Housesitter pet-sit for us in December 2016/January 2017 for 1 week. Bill did a wonderful job of looking after all our pets while we were away and we came back to very happy, healthy little pets. 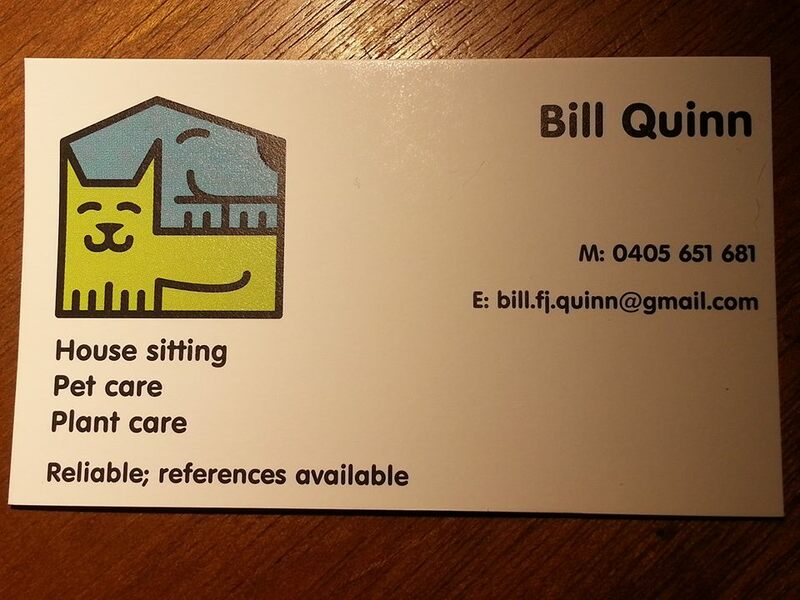 Bill had to look after 2 cats, 1 dog and 2 guinea pigs and he did so with ease. Bill also did a fabulous job of caring for our garden, watering the plants/flowers, and the garden was probably in a better condition when we got home. Bill was excellent in looking after the house also, making sure all the windows were shut and cushions brought inside before storms. Bill also put in the effort to round up all the pets and bring them inside safe and sound before any storms hit. Finding someone like Bill to pet-sit your house and pets makes going away that much easier. We would not hesitate in recommending Bill for any petsitting positions and we will definitely be using Bill again should we need to. He is kind, caring and seems to have a love of animals. He is also able to spend a lot of his time at home with the pets which the pets absolutely love! Thanks again Bill for a wonderful job!